Just in time for the holiday season, here’s a guide to few nearby travel adventures. Trekking to special places is a marvelous way to celebrate the holiday season with family and friends and accomplish a little holiday shopping, too. One particularly distinctive place to visit is the newest Puget Sound AVA winery, Sailor Vineyards, just outside of Port Townsend. 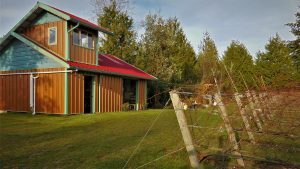 The winery is distinctive for three reasons: the owners’ nautical background, 3 acres of vineyards in the scenic hills above Port Townsend and the grape variety planted — Marechal Foch. After years of sailing the seven seas, Kit and Claire Africa cruised into Port Townsend and traded in their sails for shovels and hammers. Their background as researchers came in handy for this new tack in life. 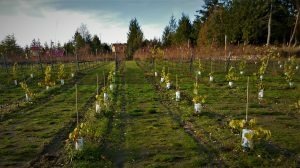 in 2009, they began the arduous task of planting their vineyard. And because of their scientific data-gathering background, each row is numbered and each vine in the rows is also numbered. And what they found was Row 18, vine 2, “nicknamed Bellwether,” is uncanny in its ability to predict days to harvest. When 18-2 grapes hit veraison, it’s exactly 55 days to harvest. And then there is Row 13, vine 13. Out of 2 acres planted in 2009, here is a vine that has yet to ripen. Coincidence? Marechal Foch (Mar-a-shal Fosh) is a French hybrid that’s an early ripener, resistent of disease and cold hardy. 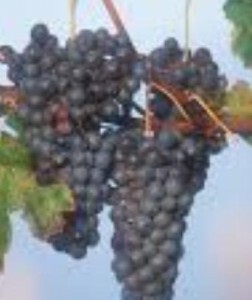 Foch is an unusual red grape because even the pulp is red. It’s versatile, produced in styles from a fruit-forward, similar to Beaujolais, to a more extracted wine with glass-staining properties. The hardworking owners are minimalists when it comes to enology, the science of winemaking. No fining, filtering or added sulfites. The newest vintage named Dogwatch Red, is a nautical term used for the short watch period, generally used to rotate the system of six-hour watches. The small production makes this wine a very special, very local gift to give for the holidays. Sailor Vineyards doesn’t have official open hours so catch up with it either their website or on Facebook. The next stop is Finn River Farm and Cidery in nearby Chimacum — an award-winning sustainable business that farms and ferments from its orchards and other orchards in Washington. Finnriver is on a former dairy farm just south of the Chimacum crossroads. This working farm is a great place for all ages to connect with nature strolling the orchards, observing the working geese and lambs who assist in managing grass and weeds and, of course, tasting some really delicious ciders. 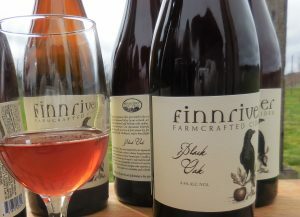 Finnriver offers “unique interpretations” of traditional and innovative ciders. There are more than 50 varieties of apples used that range from desserts and russets to the more traditional bittersharps. Old European and early America varieties with names like Wolf River, Tom Putt and Cox Orange Pippin are fermented together. Here you can enjoy at least over 25 bottlings in traditional, craft, botanical and the orchard series. Some ciders are blended with other fruits, some use wine yeast and some use beer yeast. And for designated drivers and those underage, try the root beer and non-alcoholic cider. 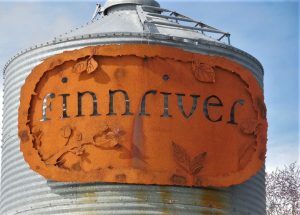 Finnriver is open daily from noon ‘til nine. Wander the orchard, learn about the apples and enjoy a taste in the Garden Pavilion. Finnriver hosts food vendors mainly on weekends, with wood-fired pizzas, Hamma Hamma oysters and bratwurst. So, bundle up, pack up the kids and go! Bainbridge Island’s Good Egg Bakery & Cafe expertly organizes unique events, pop-up dinners and private parties. 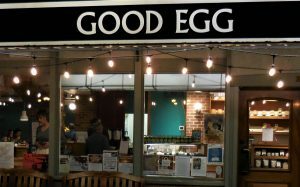 Good Egg was opened by Alice Hunting and Lena Davidson a year ago, and they cook up both simple and fancy affairs for breakfast, lunch and special occasions. One recent special occasion was a pop-up event for the worldwide Beaujolais Nouveau release. 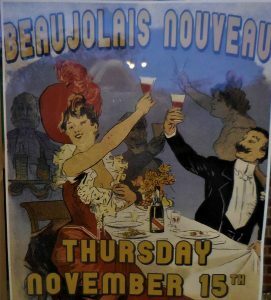 Beaujolais Nouveau is the first wine of the vintage and is always released the third Thursday of November. It’s a festive start to the holiday season. I love tasting this wine to get a glimpse of what France’s newest vintage has produced before it’s released two or three years from now. 2018 harvest looks to be very good. Good Egg tapped a cask of this and served up some delectable dishes. On the menu: Salmon Mousse Tartine, Roasted Half Chicken with Carrots and Lentils, Polenta in Delicata Rings with Beet Relish and crispy Kale, and Cabbage Rolls with Merguez and Rice. The atmosphere was warm and welcoming, a nice place to be. If you’re interested in these wine related pop-up events, join the restaurant’s mailing list or check out the events calendar at www.goodeggbi.com. Hunting’s enthusiasm for wine began while working for a full service wine cellar in Seattle. After she and Davis opened Good Egg on Bainbridge Island, they collaborated with Harbor Square Wine Shop and Tasting Room for these wine related pop-up events. Soon celebrating 12 years, Harbor Square Wine Shop and Tasting Room is a great place to pick up a few bottles for gifts and for those special dinners. They have one of the biggest collections of large format wines in Washington State including magnums, Jeroboams, Methuselahs and other larger formats named for Persian kings. Located on Winslow Way East, there are over 1,000 wines from all around the world with particular emphasis on wines from the Northwest, France, and Italy. Wines include selections for everyday, special occasions and your cellar. The Wine Bar is also a wonderful place to hang out. Wines by the glass are poured from a twelve tap system that keeps the wine under a nitrogen blanket to prevent oxidation or vinegar bugs taking over. This system allows the Wine Bar to feature boutique wineries with higher quality than is usual for selections of wine by the glass. Did you know Seabeck has a winery? Yes, in scenic Seabeck a family-run winery is making wine from grapes harvested from the Red Mountain AVA. While Seabeck Cellars is not yet open to the public, you can find their wines at Seabeck Landing General Store and Lone Rock Mercantile both on the Seabeck Highway. Holiday in the ‘Hood 2018 takes place on Dec. 16. Party with Grape Killers Guardian Cellars, Baer Winery, Stevens Winery, Mark Ryan’s Board Track Racer and Sparkman Cellars in the Woodinville Warehouse District wineries and tasting rooms. They’ll be serving up killer wines, tasty snacks and “the crazy antics you could only expect at a Grape Killers event.” Tickets can be had from https://www.brownpapertickets.com/event/3907731. Italy is the second largest and in some years largest, wine producing country in the world. With 20 regions, 97 provinces, over 2,000 grape varietals and a classification system that is complicated, to say the least, Italy is the go-to wine for many wine lovers both novice and pinky up. For many, Pinot Grigio and Chianti are their limits for this wine region but there so, so many more regions to explore. Gargenega, Gavi di Gavi, Amarone di Valpolicella, Montepulciano d’Abruzzo, Nero d’Avola, Prosecco, Fiano de Avellino, Frascati and Soave are all wonderful if not familiar to the average American. But everyone has heard of Tuscany, where there are six distinct Denominazione di Origine Controllata e Garantita (DOCG for short) regions for a sea of red wine. Chianti, Brunello di Montalcino, Vino Nobile di Montepulciano, Morellino di Scansano, Carmignano and Bolgheri all have one grape in common – Sangiovese. Despite the recent changes in regulations to include international grape varieties, Italian wines for the most part are bonded to the traditional, indigenous varieties which are estimated to be around 2,000. Of those many grape varieties, Sangiovese takes the cake for the most widely planted in all of Italy. Tuscany or if you’re Italiano, Toscana, is the most beloved region in Italy. Not only for wine but as the birthplace of language, arts (the Uffizi Gallery has masterpieces of Michelangelo, Botticelli, Rubens, Caravaggio, Rembrandt and more), sciences and literature. All under the patronage of the Medici who followed in the Roman footsteps of planting vineyards everywhere they ruled. Tuscany is an undulating landscape with hillside vineyards surrounding hill topped towns that supply the vast majority of the best wines. Sangiovese vines are widely planted in Tuscany and have been as far back as three centuries ago. There are a plethora of Sangiovese clones, some are known by their place name and have local names such as Brunello or Prugnolo Gentile. You’ll find it in places such as Vino Nobile di Montepulciano, Chianti, Brunello di Montalcino, Maremma, Morellino de Scansano, Carmignano and Super Tuscans. It’s the mainstay of Toscana wines with other grapes playing a supporting role only in Chianti and Carmignano. Bolgheri DOC, home to the first Super Tuscan, is more international in its regulations. For the most part, Italian wines have place names on the labels unlike New World wines with grape names on the label. For example, Chianti is a place within the borders of Tuscany in Central Italy. In the Chianti region, DOCG regulations require that seven Chianti zones be composed of at least 70% and could be up to 100% Sangiovese with no more than 30% other grapes that could include traditional red grapes, Canaiolo and Colorino and/or International varieties Cabernet, Syrah and Merlot. White grapes, Trebbiano and Malvasia, may not exceed 10% of the blend and Cabernet Sauvignon and Cabernet Franc may be 10% separate or together. These regulations are more stringent and mind boggling for the eighth zone, Chianti Classico. Surrounding the hill top town of Montalcino are the vineyards of Brunello di Montalcino and Rosso di Montalcino. Brunello, which translates to little dark one, is the local name for the large berried Sangiovese Grosso clone used for these wines. Winemaking in Montalcino dates back to the 14th century but it wasn’t until the 1870s when Ferruccio Biondi-Santi isolated the Sangiovese Grosso grape and made a particularly wonderful batch of wine from his grandfather’s Il Greppo estate. At a time when most wines were white and sweet, this was pretty daring. He also went further to limit yields and extended the maceration process for more concentrated and intensely colored wine. One hundred years later, Brunello was named one of the first DOCGs and with that came the regulations. Only one grape, Brunello is allowed, age it for four years with at least two in wood. For Riserva, it’s six years with at least 2 in wood. As you can imagine, all that time drumming your fingers, waiting for the Brunellos to mature could make one very thirsty. There is a solution to that dilemma. It’s the Rosso di Montalcino or red of Montalcino. This baby Brunello has more relaxed regulations and only needs to be aged for one year. Two DOCG regions that allow grape varieties other than Sangiovese clones are Carmignano and Morellino di Scansano. Carmignano is located northwest of Florence on the north bank of the Arno River. Here, Sangiovese has been blended with Cabernet since the 18th century. Today’s regulations allow 10 to 20% Cabernet or Cabernet Franc, up to 20% Canaiolo, up to 5% Mammolo, up to 5% Colorino as well as up to 10% white grapes. Carmignano can be released two years after the harvest with one of those years in wood. Riservas require 3 years with half spent in wood. Scansano is another hilly Tuscan region located in the Maremma region on the coast of Tuscany. It achieved DOCG status in 2007 and now must contain at least 85% Sangiovese and the balance can be – get this – any red varietal approved in Tuscany. That opens the blend up to include the Cabernets, Merlot and Syrah in addition to the traditional grape varieties. Morellino di Scansano does not require wood ageing and can be released the first May after harvest. Riservas on the other hand will not be release until the January two years after the harvest. One of those years must be in wood. Tuscany also has offers an amazing array of culinary dishes like fresh Ricotta from Siena, panzanella salad, tomato bruschetta, olive oil, truffles, Zuppa Toscana, Pizza Margerita, cannelloni, gnocchi and Salame di Cinghiale (wild boar sausage). Tuscany is truly a culinary adventure. Go forth and explore! It’s almost lunar New Year, which finds revelers around the world ushering in the Year of the Rooster. And with any cultural celebration of this kind, you will need friends and family, food and wine. My favorite rooster is pictured on a bottle of Chianti Classico, the gallo nero or black rooster. The black rooster on that bottle of Chianti Classico is one of the most widely recognized emblems of a quality wine. But that wasn’t always the case. Back a century or two, winemaking in Chianti was pretty much a free for all. Canaiolo was the main grape variety with lesser amounts of Sangiovese, Mammolo and Marzimino in a supporting role. Somewhere along the way, Malvasia and Trebbiano, both white grapes, were added to the mix to soften the wine and make it more drinkable. The region really didn’t have any guidelines for the “recipe,” so in the early 1900s, the government stepped in to help by classifying the area to decrease the huge amounts of faux Chianti produced. They did this by acknowledging Chianti as both a wine region and a “recipe”. Then as all governments are wont to do, they passed many laws requiring winemakers to meet certain criteria if they want to put the name Chianti, Denominazione di Origine Controllata (DOC) or Denominazione di Origine Controllata e Garantita (DOCG) on the label. In 1996, another major regulation modification brought about colossal change to the grape varieties permitted. The minimum percentage of Sangiovese increased from 75% to 80% and could be as much as 100%. In addition, the other twenty percent could be other native red grapes, such as Canaiolo, Mammolo, Colorino or even non-native varieties, such as Cabernet, Syrah or Merlot. As of 2006, white grapes are no longer permitted in a Chianti Classico. Those stringent regulations included minimum alcohol levels, any new vineyard may only be used after its fourth year, yields must be less than 3.34 tons per acre, production is limited to 6.6 pounds per vine , seven months minimum barrel aging, for Riservas, 24 months minimum maturation with at least three months bottle aging and the most interesting and perhaps comforting, before bottling, the wine has to pass a chemical exam and approval by a tasting panel. Makes one kind of feel like royalty. A few years ago, the Consorzio Gallo Nero organized the Chianti Classico 2000 Project to modernize viticulture and improve quality. This was sorely needed because during the 20th century, clones of Sangiovese, of which there are a boatload, were planted more for quantity than quality. When replanting, many growers planted whatever was available not taking into account the extreme soil and climatic differences around the region. The project took 16 years to complete, 16 experimental vineyards, five research cellars; ten meteorological stations installed to track micro- and macro-climate patterns. Hundreds of clones were identified. A few Sangiovese, Canaiolo and Colorino clones were chosen because they were less susceptible common viral diseases, had smaller berries, thicker skins, and more open bunches. Those clones are now producing some delicious Chianti Classicos. Look for the 2013 vintage to accompany your next plate of pasta. Or Sausage Pizza, or Spaghetti and Meatballs, or Rigatoni with Bolognese Sauce, or Wild Mushroom Risotto or Potato Gnocchi with Gorgonzola Sauce. Chianti Classico refers to the oldest area, the classic region. It’s located between Florence and Siena and is the hub of the Chianti region within the larger Tuscan region. Like spokes surrounding the hub, are seven other Chianti zones, each with its own particular soil, climate, and regulations. They are Colli Aretini, Colli Forentini, Colli Senesi, Colline Pisane, Montalbano, Montespertoli and Rufina. On their labels are their Chianti names such as Chianti Colli Senesi (the hills of Siena) or Chianti Colli Forentini (the hills of Florence). But enough of Italy, let’s talk about Washington State. There were about 400 tons of Sangiovese harvested in 2004. It’s a prolific but difficult vine, likened to Pinot Noir. Through the years planting increased and by 2015 tonnage was up to 1, 300. It’s planted in some of the best vineyards in the Wahluke AVA, Red Mountain AVA and scattered around the Columbia Valley AVA. Cavatappi’s with its red wine stained label, to the best of my recollection has been around the longest, some 30 years. Leonetti, Walla Walla Vintners, Five Star, Tagaris, and Kiona have also been producing for some time with at least 75% being Sangiovese and perhaps a touch of Cabernet in there as is done with the Super Tuscans. Smaller, newer wineries fermenting Sangiovese in no particular order are Sequim’s Wind Rose Cellars, Vino la Monarcha from Victor Palencia who also fashions Jones of Washington’s Sangiovese, Latah Creek out of Spokane, Brian Carter’s has a little Cab and Syrah added to his Sangiovese, Helix by Reininger, Maryhill Winery along the Columbia River sources Sangiovese from Elephant Mountain Vineyards in the Rattlesnake Hills AVA, and Walla Walla’s Five Star Quinque Astrum, which is Italian for five star. The Rosé of Sangiovese by Barnard Griffin has won gold numerous times and Waterbrook makes a pretty rose colored tasty one too. Pairing Filipino cuisine with a beverage that is heavily influenced by the Spanish who brought tomatoes, sausages, peanuts and wine; and the Chinese with their fish paste, soy sauce, rice, noodles and spring rolls is a bit of a challenge. Many dishes are made with tart tropical fruits, pickled in vinegar, steeped in garlic and soy sauce. And let’s not forget the salted dried fish. Ingredients that are not exactly easy to pair with say a Northwest Syrah or Chardonnay, right? The quintessential Filipino signature dish is Adobo. It has plenty of garlic, black pepper, vinegar and soy sauce. The former two are fairly easy to pair with most wines. The latter two are trickier, especially the soy sauce. With this classic dish, the basic rule to remember is no tannins and lots of fruit for contrast to the tart, salty flavors of the Adobo. Here is what comes to mind. Filipino tradition dictates a San Miguel or a sweet, cold fruit drink sometimes made with vinegar. These are quite popular in this tropical climate. The popular Lambanog is an alcoholic beverage described as coconut wine distilled from the sap of the unopened coconut flower. Drinks from tropical fruits, mangoes, bananas, limes, coconuts and oranges would also be refreshing. Spanish Sangria is a popular drink. It’s a red wine made with a dollop of simple syrup and lots of fresh tropical fruit floating on top for a thirst quenching drink to pair with the vinegary, salty, spicy Adobo. Here in the northwest, there are many beautiful fruit forward wines. Let’s explore some of the more exotic wines available here. First though, my go to book on pairing, What to Drink with What You Eat by Andrew Dornenburg and Karen Page, suggests that the best wine with a soy-sauced dish is Gewürztraminer followed by fruity wines and then sparkling wines. The Kitsap Wine Festival introduced me to a few new wineries that make beautiful Gewürztraminers. First was Naches Heights Vineyards. This Gewürztraminer with its lovely fragrance of lychee fruit and apricot, tangerine and green apple flavors has an off dry style that makes this a superb match with both the Adobo and Lumpia. Masquerade Wines 2011 Columbia Valley Gewürztraminer has that typical floral, spicy Gewürztraminer fragrance and tropical fruit flavors in a slightly sweeter rendition of the grape, a nice contrast to the pepper and soy sauce. For red wine, I highly recommend the Baco Noir grape. 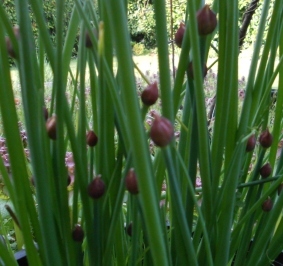 This is a hybrid that is prevalent in both Michigan and British Columbia. Being half American and half vinifera grape, it can survive those blustery cold climates. Stina’s Cellars in Lakewood Washington has a 2010 Baco Noir that is all blueberry, plum and pepper with a smooth and supple mouth-feel. Highly recommended. Two Mountain Winery doesn’t make a Baco Noir but does make a wine with similar smooth and supple characteristics. Lemberger is a relatively obscure European vinifera grape known as Blaufränkisch, the blue French grape. Their Lemberger from Rattlesnake Hills with flavors of boysenberry, fig and white pepper would be another perfect wine with the Adobo if only it were available! Be on the lookout for their soon to be released 2012. Kiona was the first winery in the United States to produce Lemberger way back in 1980. Their Lemberger is a consistent award-winner. It’s bright black fruit and pepper flavors and smooth medium-bodied texture would pair very well with the Adobo. But enough about wine, let’s talk about beer. As you well know, there are many, many beer styles and with this vinegary, black pepper, soy sauced dish, the same guiding principle: No over the top bitterness. With beer, bitterness comes from compounds in the hops. International Bittering Units scale (IBUs) measures how much bitterness is absorbed during brewing. And, of course, the hundreds of different hops have differing levels of bitterness. For local beers, try SilverCity’s Clear Creek Pale Ale. It’s a blend of three lightly toasted malts that add a mild caramel character to the flavors. This beer has mild Centennial and Amarillo hops and then a bit of time in the conditioning tank so it is mild and refreshing. Poulsbo’s Sound Brewery’s Koperen Ketel Belgian Style Pale Ale has 18 IBUs, relatively low on the IBU scale. For instance their Reluctant IPA is an American Style IPA at 52 IBUs. This copper colored ale has an herbal, fruity aroma and a clean dry finish. And then there is the idiosyncratic Slippery Pig Brewery also in Poulsbo. Their Curly Tail Stinging Nettle Pale is flavored with Cascade hops and Stinging Nettles so the resulting IBUs are quite low. I think it would be a great match for the Adobo. Summer is officially here and the season of picnics, BBQ and outdoor cooking begins in earnest. What drink to pair with grilled salmon, smoked chiken or roasted tomatoes? Barbera! This prolific vinifera grape orginates from the Italian Northwest in the Piedmonte. It produces a wine low in tannins, and high in acidity even when fully ripe; so it is prized in warm climates like Piedmonte, Eastern Washington and the San Joaquin Valley. In Italy, if it’s a DOC or DOCG then Alba, Asti and Monferrato are the names you’ll find on the label after Barbera. To me, Barbera is the wine to have with fresh tomatoes sprinkled with Gorgonzola, balsamic, olive oil and torn basil. It’s also a magical BBQ moment especially with most cuts of meat that have a sweet, smoky tomato based bbq sauce like ribs, chicken, and juicy burgers. Spring brings out the fresh herbal dishes in my kitchen. When the bright green sorrel, pungent chives, lemony lemon balm and asparagus have sprung up in the garden, it’s time for my favorite go-to vegetable wine, Sauvignon Blanc. Having oysters, goat cheese or roast chicken? Try a Sauvignon Blanc. Grilled seafood, smoked salmon, vegetarian dish? Sauvignon Blanc. Sauvignon Blanc is an aromatic, herbal, citrusy and refreshingly acidic. These components pair well with seafood with lemon, goat cheese and strongly flavored vegetables. It’s pungent, grassy, citrus flavors range from grass, hay, green pepper, lemons, grapefruit to gooseberries. 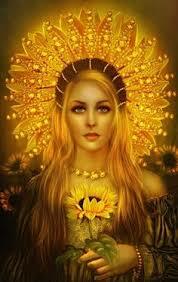 It all depends on how and where it is grown. The vines are more apt to concentrate on leaf and shoot growth so a stern canopy management plan is needed to achieve balance between the green and the fruity parts of the vine. Most Sauvignon Blancs are fermented in stainless steel at low temperatures to enhance and preserve every bit of fruit and tame the acidity. The wines are best drunk young. Two classic, high-end Sauvignon Blancs come from two appellations on the banks of the Loire River in Central France, Sancerre and Pouilly-Fumé. These wines have a minerality that distinguishes them from counterparts on the west coast and New Zealand. But if you’re looking for a good value, the Loire’s less famous appellations of Touraine, Menetou Salon, Reuilly and Quincy are delicious. A white Bordeaux is a blend of crisp Sauvignon Blanc with the much fatter, less acidic Semillon. In the value conscious Entre-Deux-Mers appellation, as well as Graves, it’s blended with Semillon in varying proportions and produces a great dry wine. Some of the world’s most famous Sauvignon Blanc is grown in New Zealand. Vines were first planted in the early 1800s, but it wasn’t until the late 1980s they burst onto the wine scene with an lavish, fruity style that put New Zealand wines firmly in the forefront. The cool maritime climate and dry gravel soil of Marlborough are perfectly suited for this grape. Sauvignon is the name seen on Chilean labels. Planted in the cool wine region of Casablanca Valley, Sauvignon is clearly in an ideal spot in Chile. Always a wine value. Many of our west coast vineyards are too hot for Sauvignon Blanc. In the cooler vineyards of Santa Barbara, Oakville Bench and the Mayacamas Mountains, a California style of full-bodied, slightly sweet Sauvignon, often oak aged, are produced. Some labels may say Fumé Blanc, a term coined by Robert Mondavi in the late 60s. Washington State makes some fine, racy Sauvignon Blancs in cooler vineyards like Horse Heaven Hills and Yakima Valley with an average elevation of 1,000 feet.